RSMSSB Admit Card: Rajasthan Subordinate & Ministerial Services Selection Board (RSMSSB) has released RSMSSB Agriculture Supervisor Admit Card on 2 February 2019. So, Candidates can download RSMSSB Agriculture Supervisor Syllabus & Exam Date, RSMSSB Admit Card 2019 and Rajasthan RSMSSB Admit Card from official website- www.rsmssb.rajasthan.gov.in. RSMSSB has released the RSMSSB Agriculture Supervisor Recruitment notification. RSMSSB is going to announce the application for Agriculture Supervisor posts for RSMSSB Vacancy. Interested & Eligible Candidates can fill their Online Application Form for RSMSSB Agriculture Supervisor Posts. 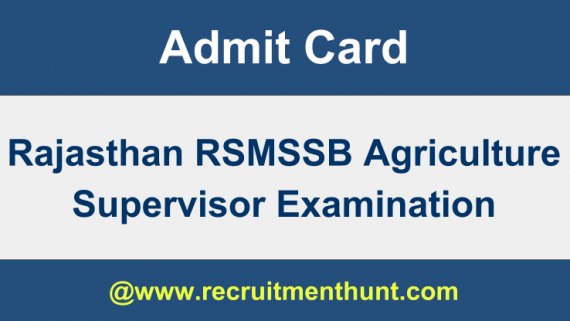 Also, know details about RSMSSB Agriculture Supervisor Admit Card 2019. The Process of Submitting Online Application started from 5 July 2018 & the Last Date for Submitting the Online Application form was 3 August 2018. Aspirants who are really interested in RSMSSB jobs should apply for this examination and start preparing for the RSMSSB Agriculture Supervisor 2019 examination. RSMSSB Recruitment releases RSMSSB Vacancy for recruitment. Aspirants should go through all the Study materials like RSMSSB Agriculture Supervisor Syllabus, RSMSSB Recruitment, RSMSSB Agriculture Supervisor Recruitment 2018, RSMSSB Admit Card and RSMSSB Syllabus. Also, they can check RSMSSB Agriculture Supervisor Exam Pattern, RSMSSB Agriculture Supervisor Previous Year Question Papers etc. Also, for more information regarding all the State and Central Government Jobs, you can also do follow or subscribe to our site i.e www.recruitmenthunt.com. These are the below-mentioned details must be printed on RSMSSB Agriculture Supervisor Admit Card 2019. Aspirants should double check if there are any mistakes in the admit before going to attend the examination. So, Candidates should take print of RSMSSB Admit Card 2019 before the exam date so that if there is an error in their admit they can rectify it before the examination. Aspirants who are appearing for the RSMSSB Agriculture Supervisor Examination should set a reminder. Also, they should carry all the documents for the Examination hall without fail. Here, we have tabulated some documents which need to be submitted during the examination. So Candidates should carry all the required documents without fail during the examination. Step 1 – Visit the RSMSSB official website www.rsmssb.rajasthan.gov.in. Step 2 – Search for the RSMSSB Admit Card tab and you will find “Download Admit Card of Recruitment Of Agriculture Supervisor Exam 2019”. Step 3 – Click on the Rajasthan RSMSSB Admit Card Download link. Step 5 – RSMSSB Agriculture Supervisor Admit Card will be displayed on the screen. Step 7 – Download and save the RSMSSB Exam 2019 Admit Card. Step 8 – Take a print out of the RSMSSB Admit Card 2019. Step 9 – Submit the RSMSSB Admit Card at the examination center with any identity Proof. Finally, Candidates can download RSMSSB Admit Card here. So, Applicants can make their preparation easier by following RSMSSB Agriculture Supervisor Syllabus & RSMSSB Agriculture Supervisor Exam Pattern and also RSMSSB Syllabus. Download Exam Patterns along with RSMSSB Agriculture Supervisor Previous Year Question Papers on this article. Feel free to contact us in case of any Queries. Also, For more Job Updates stay Tuned to our site Recruitment Hunt.